Sooner or later we all have to make a decision: Will I be a nonconformist? Will I refuse to be squeezed into the mold of the world? (J.B. Phillips terminology) Will I be part of a Christian counter-culture? (John R.W. Stott terminology) Will I be God's own person, an alien and an exile in the world, put here to have a redemptive influence? (The apostle Peter's terminology) Jesus simply calls us his disciples. Bottom line: until we are really ready to cross the line and live totally for the Lord, we're not going to be able to fully recognize God's will for us. There are no arm-chair quarterback Christians. There are no sideline disciples. There are no back-seat driver Christians. We either choose the Lordship of Jesus, or else we reject it. So what's your decision? Holy God, I believe that Jesus Christ is Lord and Savior. I believe that he came to earth as a human, lived an exemplary life of grace and power, and died for my sins so I could live for you, and with you, forever. Please forgive me, O God, for the times that I have hedged on my commitment to you and flirted with the darkness. I want to live for you with passion, joy, and fulfillment. 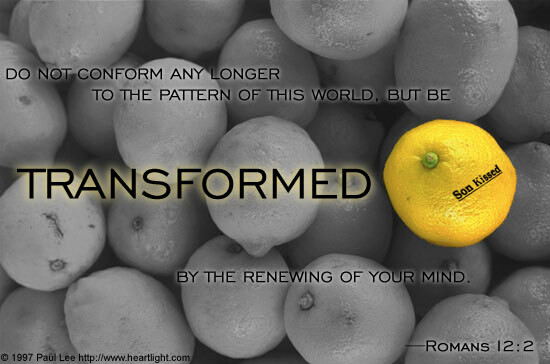 I want to be transformed to be like Christ. In his name, Jesus the Lord, I pray. Amen.